Global Warming Is For Real II. How Do We Move Forward? The Intergovernmental Panel on Climate Change has just issued a new report, reported in yesterday’s New York Times, “Climate Efforts Falling Short, U.N. Panel Says”. The IPCC is saying that an intensive effort is needed in the next 15 years to prevent the global average temperature from rising more than 3.6 degrees Fahrenheit (2 degrees Celsius) above the preindustrial level. Since the U.S. and China are the biggest emitters of carbon, it is critical for the U.S. to show leadership on this issue. 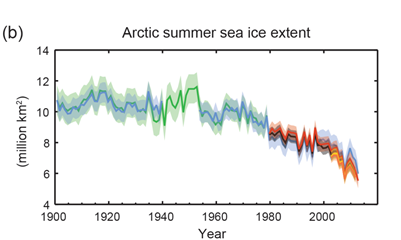 One dramatic piece of evidence that global warming is real is the rapidly shrinking size of the artic polar ice cap measured at the end of each summer. In a previous post last December 8, I took note that at least 29 U.S. companies “are incorporating a price on carbon into their long range plans.” I also noted a report from the Congressional Budget Office which estimates that a tax on energy companies of $20 to emit a ton of CO2 would raise $120 billion a year and raise the cost of gasoline by 10 to 15 cents per gallon. The scene is clearly set. There is a serious threat to life on earth. We have a good estimate of what it will take to meet the threat and a specific time window for responding. We also know the approximate cost of a sensible plan for doing so. Can our democratic political system be moved to action? A large energy tax like this will take a bite out of the economy. An attractive way of building support would be to make it part of broad based tax reform designed to stimulate the economy with lower individual and corporate rates offset by closing loopholes and eliminating deductions. In fact a carefully assembled package might be able to reduce carbon emissions, stimulate the economy (with lower tax rates) and raise revenue to pay down the deficit, all at the same time! This entry was posted in carbon tax, global warming, Intergovernmental Panel on Climate Change, IPCC, Jack Heidel, New York Times, pro-growth economic policy, pro-growth tax reform, tax policy, tax reform and tagged artic ice extent, Carbon tax, economic growth, IPCC, jack heidel, New York Times, tax reform by jackheidel. Bookmark the permalink.